The core technology used in a “videoconferencing system”—the generic term for the technology used to conduct tele-intervention—is digital compression of audio and video streams in real time. The hardware or software that performs compression is called a codec (coder/decoder). TI hardware has changed dramatically over the past years. Initially, expensive dedicated equipment such Tandberg systems were employed. As hardware has become more advanced – and smaller – more portable hardware such as laptops and ipads are being used in many EI programs. Please review the section on Privacy and Security considerations, which is an important part in the selection of your videoconferencing platform. Document presenters can be used by TI providers to make instructional objects appear larger when viewed by the parent from their home computer. Document presenters are particularly useful for sharing print materials, such as books or reports. Sound Beginnings at Utah State University uses a document presenter when needed. Here is a link to one source for document presenters. As technology advances, some key factors need to be considered. Startup costs for technologies used for TI vary greatly. 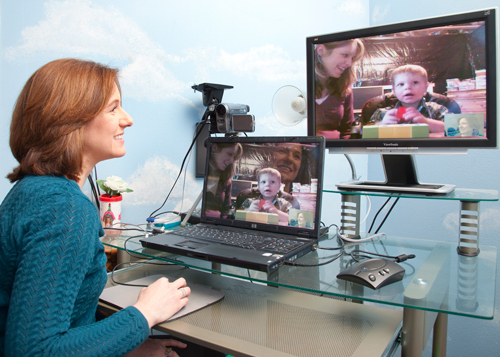 At the high end, video conferencing equipment can be placed in families’ homes as well as at the provider’s location (e.g., Tandberg, Polycom, Sony). On the low end, existing computers can be used with free software, such as Vsee or FaceTime for Macs. Some EI programs have purchased laptops for families. When this is done, they have locked down access to other programs on the computer to prevent viruses, spyware, or other software applications that can hamper the laptop’s speed or functionality. Although systems such as the Tandberg system provide excellent quality, it requires very strong bandwidth and support from technology specialists and was not portable. Vidyo is a platform also being used to do tele-intervention; the monthly charges are relatively affordable and it comes with its own recording system. Given the rapid evolution of this technology for providing in-home intervention services, it is likely that technology options will become higher quality, less costly, and more widely available. To assist new programs who are in the planning phase of a tele-intervention effort, a fillable cost calculation form has been created. This form can be filled in and changed electronically by individual programs. A sample cost calculation form is also provided. In addition to the one-time expenditure for the hardware and/or software, an ongoing service fee may be charged. These costs may range from $10 - $30 per month, and these fees may be associated with each point-to-point connection. The bandwidth of the internet connection is the KEY determinant for audio and video quality that is required for a good TI session. All technology systems, regardless of cost, are affected by bandwidth. Bandwidth can be an issue in all geographical locations, urban and rural, because there are multiple factors that impact bandwidth. Because it is traffic dependent, bandwidth can be affected by the number of people using the Internet during a particular time of day, by the weather, by technology problems that cause rerouting of information over the Internet, and by the location of computers behind network firewalls or on a high use local network. Although the infrastructure for greater bandwidth is increasing dramatically nationwide, so is internet traffic. Just think of the demands placed on bandwidth from Netflix and YouTube! We found during our bandwidth throttling experiments, in which we controlled the amount of data traveling through a network, that various two-way video systems behaved differently with lower bandwidth. In general, most systems required at least 2.0 Mbps upload speed for reasonable quality video on the receiving end. Keep in mind that upload bandwidth is just as important as download bandwidth in regards to video conferencing, and the upload bandwidth is often lower and not included in marketing materials. It may be necessary to purchase greater bandwidth for a family’s home in order to provide TI with adequate two-way video. Keep in mind that none of the broadband Internet providers guarantee that the speeds they advertise will be available all the time – they're advertising maximum speeds. One way to optimize the bandwidth during TI sessions is to make sure that other devices in a home are not competing for bandwidth during the TI sessions. This includes smart phones, iPods, MP3 players, blue-ray devices, video-game systems, and many other devices. Technology support personnel or consultants, who can help maintain equipment and trouble-shoot problems with connectivity, are valuable yet not always available. Additionally, some TI learning community members used technology system specialists to set up technologies and internet connections in families’ homes and guide families through use of the technologies. 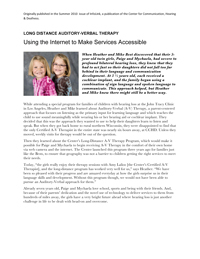 Families reported that this support increased their confidence in dealing with the technology aspects of TI. Product tutorials: Many distributors of technology systems have online tutorials to guide users. Online courses: Free courses that you can complete as needed are available online and can be located through search engines. It is important that families find TI technologies easy to use. For that reason, families may be more comfortable using a home computer and programs such as Skype, as they might have previous experience with these programs. Likewise, many providers may feel more comfortable using some systems over others. Because technology can feel overwhelming, we recommend using a checklist of steps prior to starting each session to ensure technology is ready and working, and to have trouble-shooting procedures ready. One example is the “Technology Check Prior to a Tele-Intervention Session” checklist featured in Section III. Larger materials and toys whose image can be captured on cameras and adequately viewed on computer screens. Recording of TI sessions is valuable for many purposes. First, families can share recordings with other family members, and in so doing, involve them in the facilitation of their child’s language development. Second, the recordings serve as documentation of child’s progress over time. Third, recordings can be used by providers as a self-assessment tool, a source of supervisor monitoring, and for use in training other providers. Almost all videoconferencing platforms now offer a built-in option for recording sessions. Recordings typically may be stored on the EI program’s own hard drives or recordings may be stored in the platform’s cloud-based system. Whichever method is used, it is important to ensure privacy and security are protected. See the next section of this TI guide to learn more about this important aspect of TI.